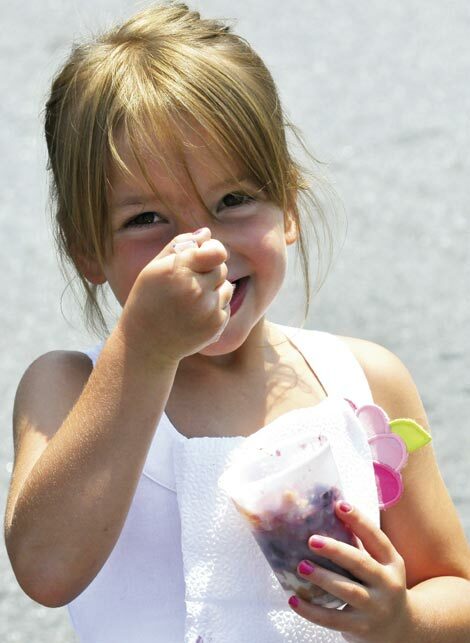 Nothing says summer like warm blackberry cobbler topped with a scoop of vanilla ice cream. The down-home dessert is the center of attention this month, when nearly 200 homemade cobblers will be presented as a giant patchwork quilt of fruit pies during the North Carolina Blackberry Festival in Lenoir. Musical performances and bluegrass pickin,’ a natural beauty pageant, and blackberry eating and recipe contests round out this delicious celebration, but the community effort to create what is likely the world’s largest display of cobbler makes it all the sweeter. The dessert quilt, now in its third installment, came about when festival promoters hatched a plan to capitalize on the town’s huge blackberry crop by creating the most enormous berry cobbler ever seen. But in realizing the exorbitant costs—$1,000 for the pan, $10,000 to build the oven, and another $10,000 to bring in a judge from Guinness World Records—organizers turned to the community. Most of the ingredients and supplies, including 12-by-12-inch pans, are donated from area businesses, and Lineberger Farms provides the berries to make some 1,200 servings of cobbler. Volunteers bake the desserts at home, and then march them into the festival, with everyone from toddlers to great-granddads turning out to watch the parade. Once the cobblers are assembled, visitors and townsfolk choose their favorites and dig in. “It really is amazing,” says Melissa Eastman, program director for the Caldwell County Chamber of Commerce. “The whole town shows up to eat the blackberry cobblers. Each one has a little flag to label who made it, and kids are really attached to the one they or their grandmother made.” And, she assures, they haven’t run out yet. July 14, 10 a.m.-4 p.m.